Last year this time of year my mom was visiting me from South Africa. I spent some of my time making lots of items to sell at an event in the golf community we live in. It is an annual tradition now and it is called the Sip n Shop. Last year I was a vendor and earned my money toward my dream camera. I knew then that it would take a long time to earn it all. Well a year later and I still hope that Santa will be kind to me. Last year Pravan had no issues with sitting with Santa and this year he did not want to be anywhere close to him. 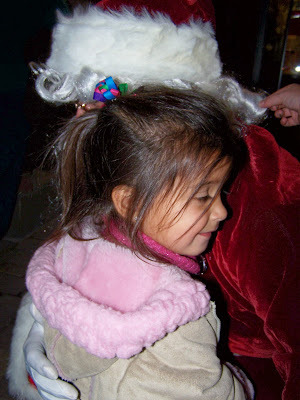 Priyasha just surprised us and she could not get enough of Santa. He hugged him this year and told him what she wanted. I was thrilled. 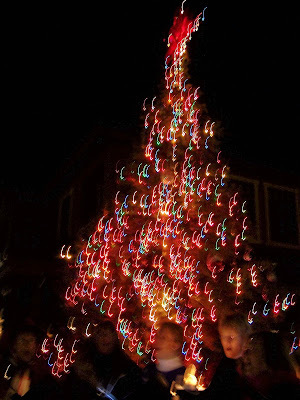 Tonight we had a tree lighting ceremony and Santa was there with the kids.I dropped the kids off in kids corner and mingled with the neighbors and sipped wine. It was great having that break. hubby joined me and we both socialised before picking up the kids. 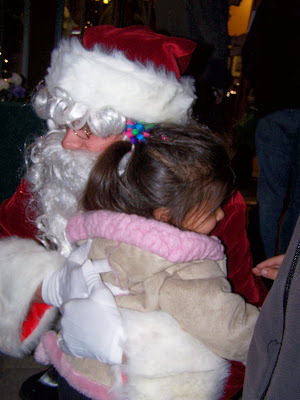 Here are some shot of Priyasha with Santa. You can see a world of difference if you go and check out this link. Brace yourselves as you will burst out laughing. Here you see the true essence of Believing in Santa. I just love the look on her face and I was truly amazed at how she embraced him. The magic of Christmas !!!!! Here is one horrible shot I got of the nice Christmas carolers. It was busy and it was hard to get good shots but this will give you an idea what we experienced. Thanks for stopping by. 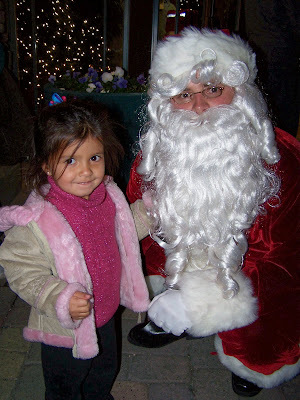 Next weekend we will meet Santa for real and getto ask him for what is on out list and I look forward to getting some great shots. How cute and how very touching! What memeories for her in the years to come!